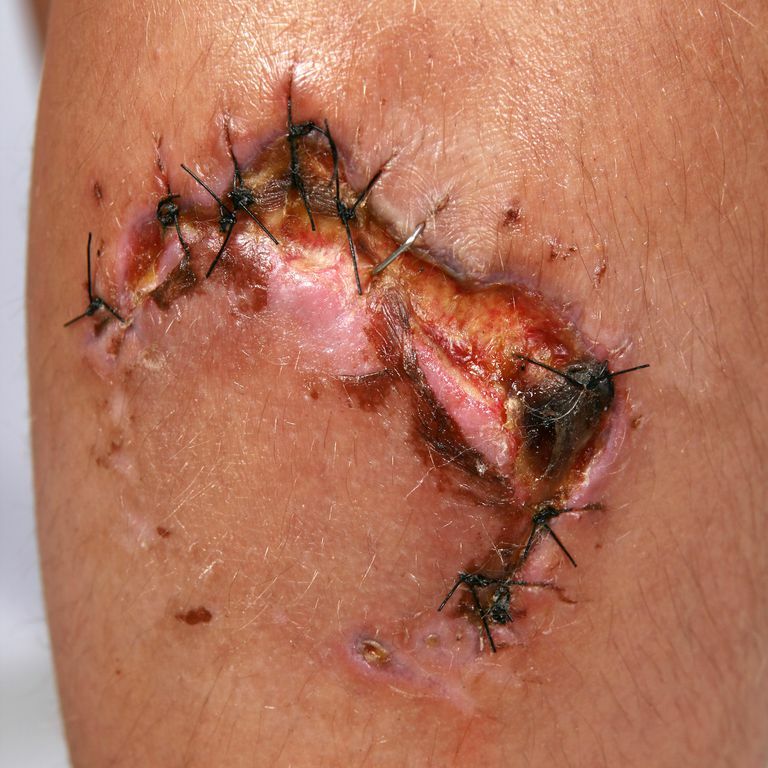 Avulsions are basically chunks of tissue removed from the body, including at least all three layers of skin. They are much more than simple lacerations, but less than full amputations. Avulsions are some of the ugliest injuries, and they come with a high degree of infection - similar to burns. They are commonly caused by animal bites, industrial equipment, or motor vehicle accidents (especially motorcycles). An avulsion that wraps all the way around an extremity and causes the layers of tissue to pull away is called a degloving injury. Imagine peeling a glove off your hand so that it ends up inside-out. That's where the term comes from. We call it degloving no matter where the injury is; fingers, feet, hands, etc. It is common for rings to catch on things and cause degloving injuries of the finger. Some degloving injuries eventually result in amputations. It can be hard to tell the difference between an avulsion and a really bad laceration. One telltale is if the laceration is through all the layers and is curved enough that you can lift up a flap of tissue. The ability to lift off some of the fat and skin is what makes it an avulsion. Generally, the treatment for a deep laceration is the same as the treat for an avulsion, if you have the section of tissue that was avulsed. If the section of avulsed tissue is not available, treat it like a burn. Avulsions and degloving injuries will almost always need surgical intervention to heal properly. Avulsions have long healing times that can't really be treated appropriately without a professional. Stay Safe. If you are not the patient, practice universal precautions and wear personal protective equipment if available. Stay clear of whatever injured the patient and only attempt to help if it is safe to do so. You will not be of any help to anyone else if you are injured while trying to save the patient. Control bleeding with direct pressure and elevation, avoiding tourniquets unless bleeding cannot be controlled and and medical care will not be available for several hours. Do not be afraid to put direct pressure on raw muscle or fat tissue. Even though the wound is open and raw, direct pressure is still the best way to stop bleeding. Use an absorbant clean dressing or whatever clean cloth is available to hold pressure on an open avulsion or degloving injury. The dressing will trap blood and hold it against the open wound, promoting clotting. Clotting will ultimately help to stop the bleeding. Rinse the wound with water or saline solution, the cleaner the better. Sterile irrigation is the best. This will restart the bleeding in many cases. That's okay. It's good to clean the wound as well as stop the bleeding. If bleeding was very difficult to stop and you are concerned that it will be out of control if you rinse the wound, then don't worry about it. Get the patient to an emergency department immediately. If the tissue (skin, fat, and muscle) is not completely torn away, replace the flap and dress the wound. If the tissue is completely separated from the patient's body, collect it if available and bring it with the patient to the emergency department. Avulsion injuries will almost always need medical care, especially if the injury was from an animal bite. Avulsions will likely need surgical intervention and bites have a high incidence of infection. If bleeding cannot be controlled, if the injury is a degloving, or if the area of the avulsion cannot be covered by both of the patient's palms, then call 911. Large avulsions and all degloving injuries are significant emergencies that should be taken to the emergency department immediately.